I finished the first border for Mountmellick! I am so happy, it feels so good to be back into my quilting life after such a long time in making easy things. Just had to share. I will still needle turn applique the corners down and finish the 4 hexagon flowers in the corners. On to Border Number Two. Have a great evening. This entry was posted in Quilting and tagged Di Ford Mountmellick. Bookmark the permalink. Thank you! I learned the hard way that the first thing sewn has to be squared or one is doomed for a mess! The border fabric is perfect. I was so blessed to have been given that fabric that was originally used in this quilt by Lu Ann! Great job. Aren’t you glad you didn’t start that other quilt? Keep on going girl! Why thank you Becky. You are doing some good work too! Having fun with the cutting machine and the Owl quilt! How pretty. The border stripe fabric is perfect. Thank you Karen. 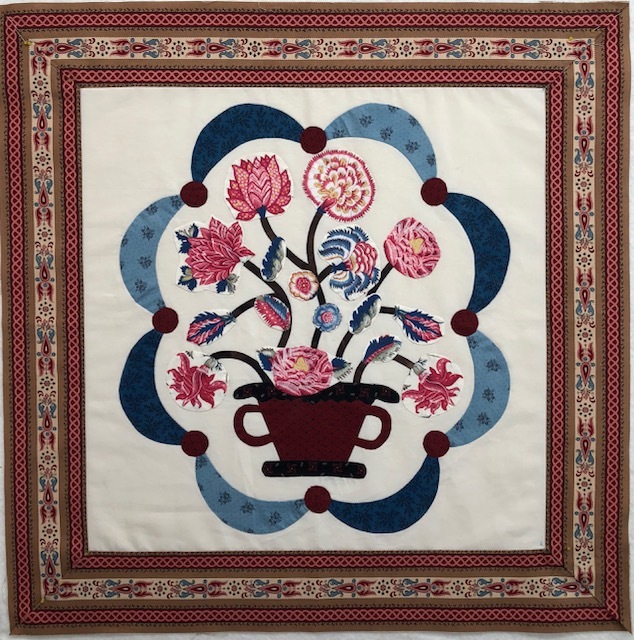 This was a Quiltmania Mystery quilt in 2014 by Di Ford and by the time I found out about Quiltmania the fabric was gone. Lu Ann saved me! Looking great! I bet you are so happy to be back to creating with your hands. It has been a long year for you but you are on the up hill side now! Enjoy the sewing and creating! Thank you and to top the day – rain and cold ! Great sewing weather! Love winter. Have a great day!